Image: Pippa Middleton attends the launch party for her new book. A new course is offering to teach women how to be the ideal ‘sugar baby’ in order to land a wealthy man. Professional sugar baby Carla Abonia, 37, has been flown across the world and had wildly lavish gifts bought for her by rich men who can’t resist her company. But she admits the relationships aren’t always straight forward, so has joined forces with her mentor, sugar daddy Alan Schneider, to form their Sugar Daddy University in New York. The pair teach five key elements of being a successful sugar daddy or sugar baby through the curriculum -- sexuality, understanding, generosity, attraction and reciprocity. What’s your favourite ice cream flavour – mint, choco chip, rum and raisin? Well, how about crocodile? That’s the unique new flavour on offer at the Sweet Spot restaurant in Davao City in the Philippines. 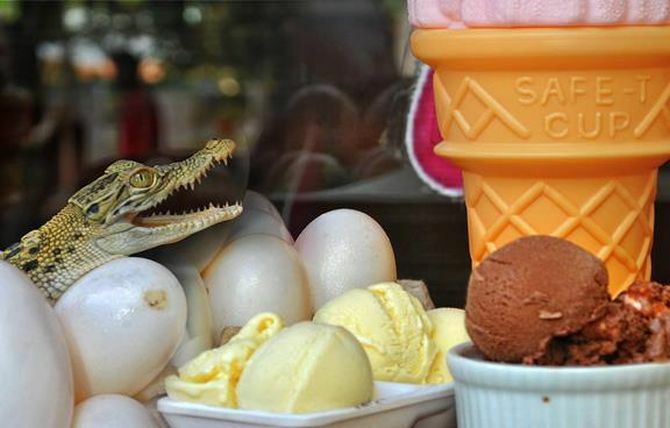 The owners of the store, husband and wife Dino and Bianca Ramos, have been selling the ice cream ever since they received a batch of croc eggs from Dino’s uncle. A German man born with one arm much bigger than the other is carving out a career as a professional arm wrestler. Matthias Schlitte was born with a gigantic right arm -- measuring almost 46 centimetre around the forearm -- due to a genetic defect. A restaurant in the Philippines promises diners a refreshing meal -- when they’re soaked from head-to-toe between courses. The Waterfalls Restaurant in the Villa Escudero resort gives guests a watery thrill, as its bamboo tables are right next to the Labasin Falls, a man-made cascade. 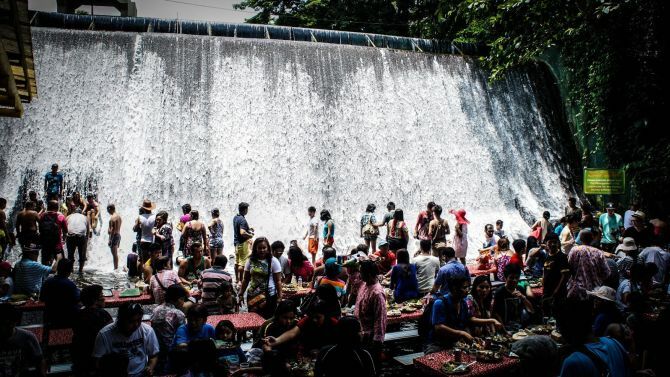 Located on a former coconut plantation in San Pablo City, the falls are run-off from a nearby dam -- and those wanting some extra refreshment can hop into the water once they’ve finished their meal. 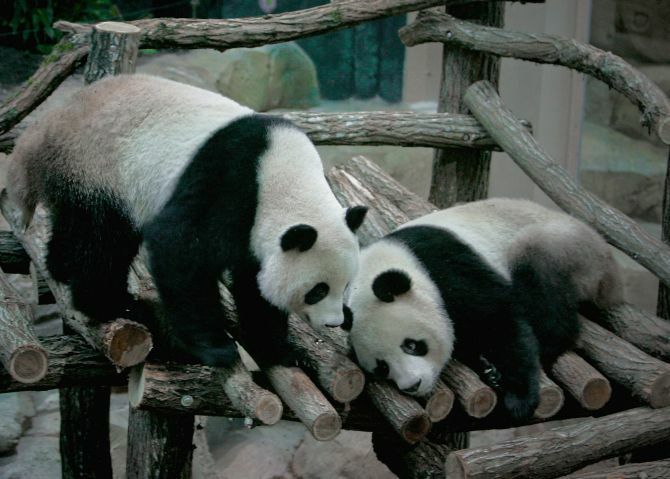 Panda cubs at an enclosure in China have been forbidden from predicting scores at the World Cup. The giant bears had been primed to predict winners by choosing their food from baskets emblazoned with teams’ national flags. But moments before the opening game kicked off, the Chengdu research base pulled out of the stunt. "The predictions have been halted by the authorities," said a spokesman for the Chengdu facility who declined to elaborate. It’s not a place where you would expect to find a horse. 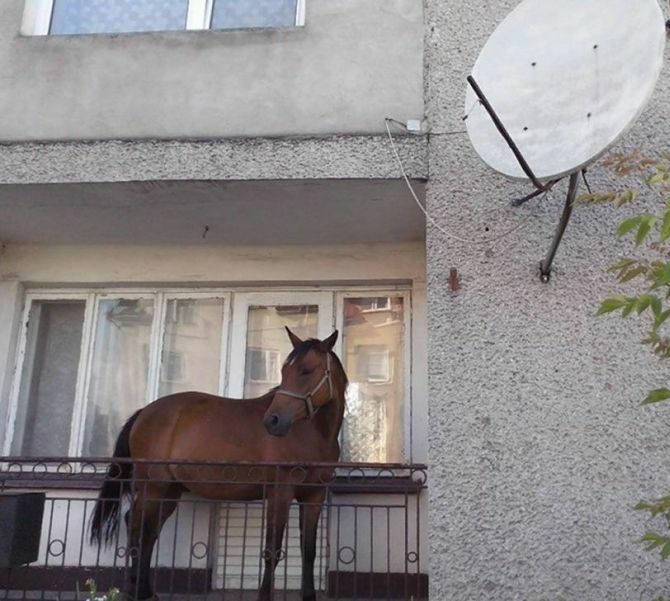 A Polish man kept a friend’s horse on his apartment balcony in case anyone tried to steal the animal. Borys Kozlowski had borrowed the horse, named Dolina, to graze on his front lawn and trim the grass. However, after Dolina had finished the work, its owner did not arrive on time collect her. So quick-thinking Kozlowski, from Grajewo in northeast Poland, marched the animal through his house and left it on the balcony in case there were any thieves around. There was something old, something new, something borrowed and something double-ply for 10 designers who battled it out on Thursday for $10,000 and the top prize in the 10th annual toilet paper wedding dress contest held in New York City. The elaborate gowns, headpieces, purses and lacey veils showed off at the competition could be made of nothing but rolls of Charmin Ultra Soft toilet paper, and materials like glue, tape and thread. Natasha Goldsworth is on the hunt for the man of her dreams, but he might be hard to locate because he would need to put up with a flat crammed with £50,000 worth of Hello Kitty collectibles. Horse trainer Natasha, 29, got hooked on the cartoon character as a teenager and has spent 15 years collecting 10,000 items. 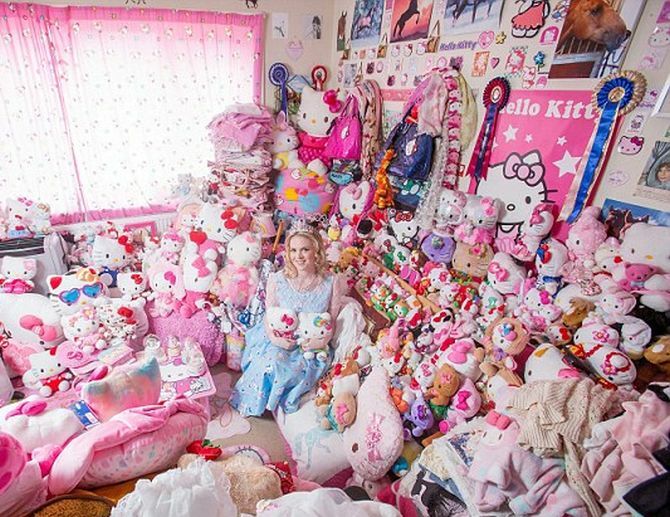 Every room of her flat is now filled with Hello Kitty accessories including jewellery, furniture, clothing, curtains, and 4,000 cuddly toys. Her Kitty Kingdom is a massive turn-off to men -- but Natasha is happy to give them the push if they don’t accept her obsession. She’s an udderly fabulous matchmaker. 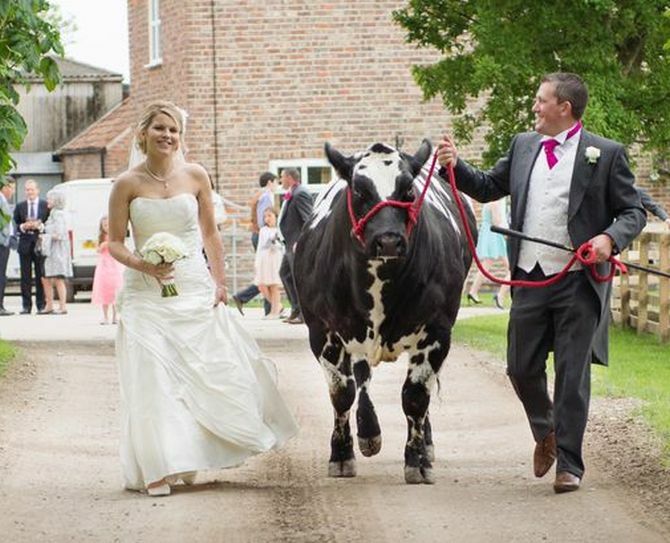 Meet Gorgeous, the prize heifer who brought newlyweds Steven O’Kane and Katrina Donaldson together. Steven, 31, from Garvagh, said that his later mother Eileen also predicted the prized cow would bring him much luck and happiness. He explained: “My mum said she felt she would bring me much happiness and would do really well at the shows. My mother passed away in October but I kept my promise to take Gorgeous to the shows and went on July 7 to the show in Yorkshire. She won the junior champion at the show. My mother wasn’t too far wrong. It was there that blonde livestock buyer Katrina fell head over heels in love... with Gorgeous.” And as they say, the rest was history. 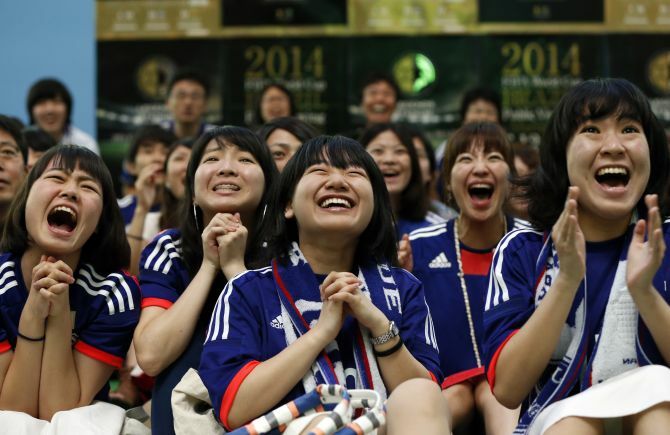 Japanese fans who watched their national team be defeated by the Ivory Coast in the FIFA World Cup on Saturday showed it is possible to lose graciously, when they stayed behind after the match to help clean up. Despite seeing the Blue Samurais lose 2-1 against Didier Drogba's team at the Arena Pernambuco in Recife, Japanese spectators armed with bin liners patrolled their side of the stadium and gathered up discarded litter. Image: Japanese fans pray as they cheer on their team during their match against Ivory Coast at the FIFA World Cup in Brazil.